I've been working to add more items to the Etsy shop as the gift giving (and buying) season gets into full swing. 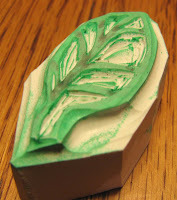 I love carving rubber stamps. I tend to work tightly and a little too precisely and the medium forces a looser approach. 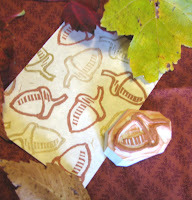 Last week I added a little acorn and leaf stamp to the Etsy shop. I need to make more -- I think there's a good demand for them and not that many Etsy sellers making them. Maybe some more new ones today? I originally carved these stamps for a Swap-Bot swap with a Chair theme. I just love chairs -- the design of them, how homey and welcome they make you feel. 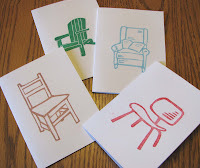 So I made large stamps of four of my favorite chairs: an Eames chair, an Adirondack (Muskoka, if you're in Ontario) chair, a nice simple straight chair, and a comfy armchair for reading or knitting or just relaxing. These potholders also started life as a swap project. The of the reason I do swaps (other than the fact that I love making them and getting mail!) is for the inspiration. Almost everytime I do a swap, I get an idea for something to make and add to the shop. The fabrics for these potholders have been accumulating in my stash -- many folks know that I love these colors and the Depression era. 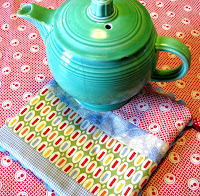 The go perfectly in my kitchen with the Fiestaware, bakelite flatware, and Hall china. Aren't they fun? Ah... the staple of my Etsy shop. 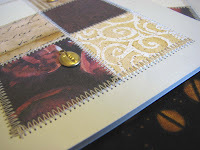 I love sewing on paper and the look I get from mixing all sorts of gorgeous papers together into a little paper quilt. The Christmas (or solstice) cards are a new color version of a design I made last year. 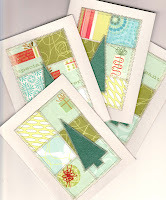 The original cards (which I call, "Gather 'Round the Aluminum Christmas Tree") were in pink and green. I love these new colors. They still fit the design well, but give an even more modern look to them (along with the retro/mid-century look I love). The good news is that the original pink and green card is included on the cover of a new book coming out soon. "1000 Handmade Cards" will be available in January 2009. What fun!